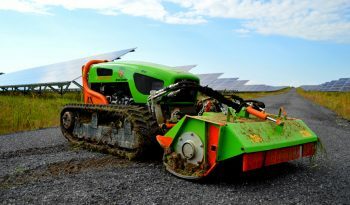 Green Climber LV600 is a long range remote-controlled steep terrain mower capable of operating on slopes up to 60 degrees. Since the operator is not on board, it can be used for cutting dangerous, steep or uncomfortable areas. It comes standard with a high performance flail for roadside maintenance but can be equipped with a variety of other hydraulic attachments. It has expandable undercarriage tracks that can be extended + 16 inches to amplify stability while lowering the center of gravity. Thanks to the advanced hydraulic system, the powerful Kohler engine and special high grip tracks, Green Climbers are virtually unstoppable on any slope or terrain. Electronic control panel + beepers + warning lights which give information about the state of the machine: low fuel level, oil pressure, overheating, etc.